This property is complete off grid and sits a lovely position with no neighbors to be seen. The property has a bore hole for water but is not functional at the moment as it needs a generator. The electric is generated by solar panels, the property is all ready for the panels, they just need to be installed. The property sits in quite an idyllic spot as there is no one to disturb your privacy except from the wildlife that surrounds the lake. Upon entering the property, we are lead into a hallway which then leads on to a large living room with a fireplace in the corner. There is lots of natural light as there are various windows in this room. In the corner there is the staircase leading upstairs, a door into the kitchen, another into the bathroom and another into a bedroom. The kitchen is a good size and has lots of units, base and wall mounted. The bedroom is also a good size, plenty big enough for a double bed. Upstairs it’s all open space and needs some finishing’s. There is already a bathroom and a bedroom up here but there is still plenty of room to make more bedrooms. The property comes with 13500sqm meters of land which meets with the lake. There is also a large garage to the side that has plenty of space for storage. As mentioned the land is very private so here you can definitely lead a peaceful, off grid life. 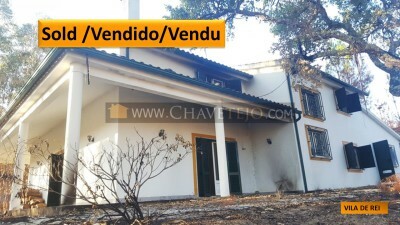 The property is situated around 8kms away from Vila de Rei where you can find everything you need such as supermarkets, doctors, schools, pharmacies, shops, etc. Ferreira do Zêzere is around 22km away and Tomar is 38kms away. Tomar, which has supermarkets, shops, builders merchants, cafes, restaurants, health centres, schools, a weekly market, swimming pools and historic Convento do Cristo and Castle constructed by the Knight Templars in the 12th century. The closest airport to the property is situated at Lisbon, which is around two hours’ drive from the cottage, though it is possible to utilize either train or bus for this journey. Lisbon airport is serviced by several low cost airlines which operate regular flights into and out of the United Kingdom and other European countries.